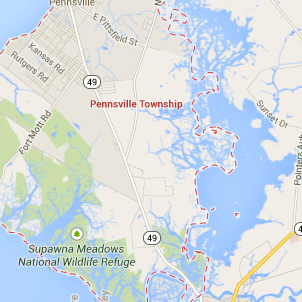 Pennsville, a township in Salem County, is home to 13,000 and the state’s westernmost point. We can further improve your home and its standing in the neighborhood with superior crafted roofs, gutters, windows and siding at an affordable cost to you as a homeowner looking to save money.Homecraft® Inc. services Pennsville NJ, Delaware, Maryland, New Jersey, and Pennsylvania with roofing, siding, replacement windows, doors, and gutters with excellent craftsmanship, materials and products built to perform. We’ve been in the home improvement industry for 30 years, so you know we can deliver on your high expectations. We have the broadest selection and highest quality when it comes to Homecraft® vinyl replacement windows, or Andersen® wood replacement windows. You are treated to superior performance, guaranteed energy savings, and many years of service you can count on. The doors on your home should provide an open welcome for family and visitors alike. For new doors in Pennsville NJ your best choice is Homecraft® Inc. We can design a brand new entryway with a rugged, durable entry door; replace a balky old patio door with a smooth-operating new sliding door; add a weather-resistant storm door to protect your home; or even replacing your rickety old garage door with a beautiful new automatic door. It’s no wonder we are among the leading door companies in Pennsville NJ! Offering all types of siding for you to choose from, from cedar shake to resemble real wood to easy-to-clean vinyl siding, you will get peace of mind knowing our siding is top quality. Depending on the type of house you have, we can advise you on the colors, textures and styles to choose for the best value. Did you know we offer you the country’s highest quality roofing systems, backed by the industry-leading “Golden Pledge™” warranty protection? Why not sleep better under a Homecraft® roof? Call on Homecraft® Inc. to be your source for roof repairs and new roofing in Pennsville. Remember, we are GAF MasterElite™ roofing contractors. You can rest easy knowing we can install the best gutter systems available for your home, paired with a well-built roof that is more efficient. Pennsville homeowners can count on Homecraft® Inc. for their gutter systems today and in the future. FREE Estimates on Pennsville NJ Home Improvement, Windows, Doors, Siding or Roofing. Call Homecraft®, Inc., today at 1-877-494-0377 to schedule a FREE in-home consultation and estimate for your Pennsville NJ home improvement project, roofing, siding, replacement windows, doors, or gutters.